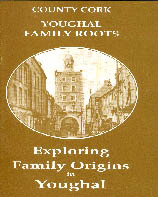 This book covers all the Streets, Lanes, and Yards of Youghal as well as 57 Townlands that surround the town.. Included in the book is the Griffiths Valuation of 1851 with corresponding 1851 Map. This lists the head tenants of each household. A Brief history of The Fitzgeralds, The Fitzmaurice's, The Desmond Rebellion and Youghal Industry down through the years as well as Sir Walter Raleigh.